The Cuban American Youth Orchestra visited campus for a musical exchange with Gustavus musicians. Members of the Cuban American Youth Orchestra play with the Gustavus Chamber Winds during the exchange. 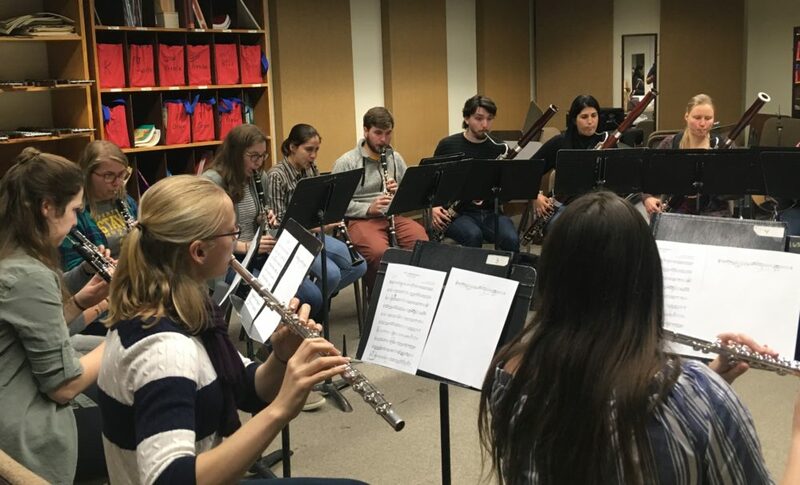 On April 18 a woodwind quartet made up of young pre-professional musicians from the Cuban American Youth Orchestra visited Gustavus Adolphus College for a musical and cultural exchange with Gustavus student musicians. During their visit, the Cuban students collaborated with the Gustavus Chamber Winds, Gustavus Wind Orchestra and also participated in a Latin jazz jam session with the Gustavus Jazz Ensemble. Clarinetist Ninián Rodríguez Rego says the experience of visiting Gustavus was overwhelmingly positive. “It was a good experience because of the chance for a musical exchange. While we played mostly Cuban music, they played classical. It’s great to share rehearsals and see how they do it here,” she says. The Cuban American Youth Orchestra grew out of the Minnesota Orchestra’s historic 2015 tour to Cuba. Gustavus Adjunct Assistant Professor of Clarinet Rena Kraut performed in the clarinet section on that tour and is the Executive Director of the non-profit. “When I left I couldn’t stop thinking about them, we developed friendships with the people there and I thought it couldn’t end there, it had to keep going,” she says. The goal of the organization is to use music as a form of diplomacy for students by bringing together cultures and learning from one another. Eventually, they are hoping to have a full youth orchestra made up of students from both countries. In November of 2017, four string players from the group visited the Minneapolis area for the inaugural Fall Academy. The group visiting Gustavus this week represents the Spring Academy, based out of the University of Minnesota School of Music. To see more photos and video from the visit, check out the stories produced by KEYC and the St. Peter Herald.